Alchemists is a game of strategy, risk assessment, and deduction. Do you experiment to get more knowledge or do you publish now to get more points? Pay to endorse the latest theory of toads or save your money for an artifact? And should you really be selling that potion to the large axe-wielding barbarian when you aren't quite sure of its effects? The choices you make will prove whether you are the world's greatest alchemist. Alchemists was one of the big hits from Essen 2014 with much ballyhoo concerning its reliance on an app to play. I was intrigued, not only by the apps inclusion (it did sound quite cool) but generally from what the game pertained to be, a heady concoction of deduction and worker placement all bottled together in that quirky fantasy world that CGE do so well. In the game players inhabit the role of back alley Alchemist’s plying their trade by combining dodgy ingredients usually found in dumpsters outside restaurants into volatile potions. It feels like a lost Discworld game with players lying, cheating and plying their dubious trade to passing adventurers before sneaking off to the Alchemist conference to brag about their findings, only to be swiftly debunked or discredited by their peers. If you’ve read any Pratchett involving the Wizards of Ankh Morpork then all of this will make you feel right at home like slipping on a pair of novelty comfy slippers shaped like a trolls paws. Czech Game’s wisely employed the marvelous David Colchard (Dungeon Pets, Dungeon Lords) for the art chores, and at first glance the whole package looks and feels like something Vlaada Chvatil’s fevered imagination could have cooked up, and its clear from reading the rules that Matus Kotry the games designer was inspired by the quirky fun that Vlaada loves to inject into his designs. Since its arrival I’ve had chance to savor this game and my feelings toward it have been as mixed as any of the concoctions we will create in our musty labs, horror, frustration, elation, joy and utter confusion. Sit a while and together we will attempt to define the base elements of this peculiar and mind numbing of games and see whether its a potion of good fortune or an icky flask that leaves a bad taste in your mouth and a permanent limp. So the game itself feels like a gloopy cocktail of Euro mechanisms with a frothy topping of worker placement all of which are simple to grasp, the explanation however required for players to understand how to go about playing, mixing the potions or more precisely understanding the findings of said experiments set’s such a high barrier for entry that many will run screaming for the hills when first presented with this puzzle. I’m not going to fully attempt this mighty feat here, just understand that each ingredient contains two alchemical elements that are a combination of positives, negatives and colors. Every time you mix a potion you use the app to scan the two ingredients and it will give you the results of that test, anything from a plus green potion to a minus red dependent on what the aforementioned elements of the two ingredients were, see what I mean. You then mark your findings on your player board, crossing off the elements you know that those ingredients cannot possibly contain based on the potion you just created. Its the the explanation of this process and getting players to properly understand what it is they are doing that is Alchemists biggest turn off, making the first play-through and explanation feel like attending an algebra lesson whilst being simultaneously water boarded. However if you persevere you are rewarded, on subsequent plays it becomes faster and then you can start to uncover the game hidden within, turning leaden first experiences to shiny gold joy on return visits. So leaving the app and the potions to one side the remainder is incredibly straight forward, it utilizes that start turn order choice previously seen in Fresco and Tuscany offering greater rewards for the lazy alchemist who stays in bed, but this can penalize you later. The early risers place they’re actions last and get to play first so there is a huge advantage to having this position especially in the later rounds of the game. As an example, one action is to test your potion on a student which seem’s a perfectly sensible thing to do, however if somebody before you manages to poison or paralyze the unfortunate test subject then he won’t drink anything your offering unless some gold passes hands. This can make or break strategy’s especially if you haven’t the gold required, with the game hurtling through its six rounds you really can’t afford to waste one moment. The remaining actions are gathering ingredients, transmuting them for cash, selling your potions to passing adventurers or buying special equipment and powers, the final couple of things you can do are either publish/endorse a theory, which comes down to either you nailing it through fantastic research or ************ completely which leads us on to the final option which is to debunk a fellow players theory. This is actually where the meat of the game is hiding and where your going to score all the lovely points required for victory or lose them all when your caught out publishing some complete bunkum, everything before this is a bountiful feast of flavor masking this cut throat race to beat your opponents to the punch and getting published first. There’s a lot of fun to be had here of boldly made claims and the satisfaction of discrediting sloppy lab work. I just fear there is a limited life cycle whereupon eventually everyone grasps the fastest direct route to nailing chemical compositions then its a game of gaming the game, if you see what I mean. This is good solid entertainment with some refreshing and interesting ideas, the inclusion of the app isn’t a gimmick and you can play without it although I suspect this was included more as a “We told you so” to naysayers than actually something any sensible person would want to do. Once you know and understand the deduction element of the potions then its a pretty speedy process and a rewarding play, although the short amount of rounds can feel punishing when your halfway through the game and still haven’t published a paper. I’m giving this a cautious recommendation, it can be fun, and will certainly give the grey matter a bit of a workout but its an acquired taste. It really comes down to if you are willing to endure the pain of learning and teaching the game and whether you can battle past those first couple of sloooow plays, this is one of those games that you’ll going to have to work at to find the goodness within, rather like batting at an armor plated pinata with a tickling stick. Let me first get a few things out of the way. 1) even though you think your family is experienced at learning new board games DO NOT sit them all down for a good 1st time thru the rules let’s learn together as we play session. Even though the rules kinda invite you to do that! 2) don’t be suckered in by the cute (and absolutely fantastic!) artwork of this game… It is pure Evil! 3) remember that time you were left in the hospital mid-tour because of a kidney stone and you asked for a crossword book from the 7-11 but instead they brought you a book of logic puzzles and you know you did them but were so doped up on codeine that you’re not sure HOW you did them and now you wish you did? Oh wait, maybe that one only applies to me. Well, go get a logic puzzle book from the 7-11. 4) don’t be fooled by the one review of the game that mentioned this was a Queens game Fresco rip-off because you love Fresco and it will be easy. No, just because you kinda have workers and you decide when to wake up each day for turn order… Imagine instead Fresco mechanics with 20 expansion rules made by the Devil and you have to play with all of them… And that’s the EASY mode! If you want to play the full game you add another 10! 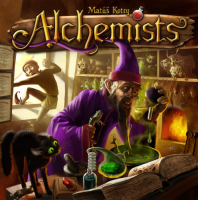 Now that that is out of the way, Matúš Kotry designed a wickedly appealing game of deduction, logic, worker placement and even a little hand management tossed in with Alchemists! CGE did their usual amazing production packing about 10 kilos of fun into a normal sized box. Oh, and the art! David Cochard brings this game from a 7-11 pulp logic puzzle book to a full fledged theme filled magical world of Middle Ages Alchemy. I really like this game! 15yo really likes it. When Mom and 17yo get back from the Italian Alps THEY will like it, I’m sure. Even 10yo enjoyed parts of it, but got a bit upset it took so long to get thru everything he ended up with a headache and tapped out around round 4 (box says ages 12+ and I’d suggest 13 or 14+ to be safe). But, I’m not sure I’d call this a ‘family game.’ And certainly not one I’d recommend anyone buy next if all they play is Catan, Ticket to Ride and Camel Up. Despite the friendly art and inviting first few pages of the rule book this game is Math-y and cut throat. Aside: a few months ago I saw CGE’s Space Alert at the library and after reading the first pages of rules I thought this would be a great game to play with the boys. The rules invited me to sit down with them and work our way thru it paragraph by fun instructional paragraph… But then I turned the page and the rules exploded into a jumble of secondary and tertiary rules that just kicked my bottom! I seem to have forgotten that experience. Hey CGE, I appreciate the instructional way you write your rules… But I need to remember that they are still rules and should ALWAYS be read thru in their entirety before teaching. Math based: the heart of this game is a logic puzzle. Every 2 of 8 elements combine to create one of 7 results that then give you insight into the three properties that make up each element… And ultimately, that’s what you are trying to figure out – what those 3 properties are. Combining different elements will eventually give you enough information to know exactly what that element is made up of. BUT if you are clever, you can logically deduce from less and less information. That’s where an advanced degree in IF/THEN can give you a leg up. But, I solved half of the elements my 15yo did and I still won by a point in our first game. That is because there are other paths to victory that include being ‘kinda right’ enough to publish a finding that will continue to give you points and possibly a grant to continue your research with bonus money and victory points at the end. Knowing the rules and all the potential victory points is also an important key to successfully keeping up with the math wiz. But there is so much more too… Managing your turn order is a mini game in itself and can earn you huge money and fame, but that too is evened out by the fact that Favor cards can change the order of things or you can get discounted out of a deal when you sell a potion to an assassin… But then THAT doesn’t matter, because your two unused action tokens just turned into another Favor card that will earn you enough gold to buy those fancy shoes that let you take an extra action! I’m not that well versed in what other people call Euro-games, but I imagine this is one of them. Lots of paths to victory, lots of rules, lots of placing things out to earn actions… But the theme seems to fit so perfectly I can’t imagine anything else replacing it. I do have one complaint… The paper you use to mark your findings on… VERY hard to read with even the slightest degradation of eyes. Each of the colors is slightly faded pastel and the + and – is even harder to see. I need more contrast. I don’t have a witty ending, so… I’ll just stop. Oh, did I mention it has one of the best reasons to add a digital device to a board game? Postscript: 15yo and I just completed the second game. Clocked in at 1:45 with rules re-reading and a few takebackzees. One time he realized he had restarted the app on his phone with a different game code, so I let him re-scan his results. That took a while and then we adjusted some of his publications too. But then I made him let me do a redo when I didn’t read the label on my Robe of Respect correctly and I was banking on doubling some respect points in the final round and bought a card that would have given me additional respect… So he let me buy a different card instead. I will say that two or three player seems perfect for six rounds of this game as you can do 5 or 6 actions a turn. With 4 players you are limited to only four actions. I don’t know how that can be good! One of the funniest moments was when he realized I was publishing and getting money and respect for results he KNEW were wrong, but couldn’t debunk correctly. HA! I won by one point, again. Alchemists is a great game of deduction, worker placement, and insight. You are an alchemist trying to discover the alchemical formula for the ingredients you need to make potions. You can do this by collecting ingredients, selling potions, buying potions, soliciting help from friendly townspeople, buying artifacts to help you in your deductions, by mixing up ingredients to see what they make and testing theories on your assistant and on yourself. If you’re lucky, you can publish your theories for fame and fortune. If you’re smart, you can debunk others shoddy work on their theories. When all is said and done, you can show off your handiwork to the townspeople for even more fame. Will you be the best alchemist in town? Only you can tell. This great game from CGE (Czech Games Edition of Dungeon Lords, Dungeon Petz and Galaxy Truckers) is a great addition to their line of games. Though there is a bit of a learning curve as you figure out how to best deduce the alchemical formulas in the game, you will be rewarded with great satisfaction as you master the game play and defeat the other wizards in the game. I highly recommend this game. It’s quite different from other offerings out there and I found it to be a refreshing change from the average game fare. I love this game. I was very surprised. The only thing that I’d have to complain about is that it feels a little too over-complicated. It seems like they could have streamlined it a little to make it less complicated. Once you get through the second round you’ll have it all sorted out though. It seems like they could have gotten rid of the selling to an Adventurer, the Artifacts, and made debunking a little less convoluted. That would keep all the fun parts of the game and make things a little faster and easy to follow. Still, don’t let that deter you. It’s a fun game if you’re into figuring out things through clues given. I love the concept of the game, the idea with using an App as game master but also allowing a player to be GM is brilliant. The game has a quite steep learning curve, but once the mechanisms are running it is really fun. In the beginning it is generally about finding a system to deduct the ingrediens that makes sense, otherwise it becomes really hard. We have only been playing the novice version, but even that I find is brilliant. Add a Review for "Alchemists"